The All-American Rejects are an American alternative rock band from Stillwater, Oklahoma. The All-American Rejects have four members in the band; the current band members are Tyson Ritter, Nick Wheeler, Mike Kennerty and Chris Gaylor. 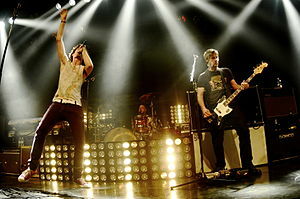 The All-American Rejects first became a band in 1999 when band member Tyson Ritter and Nick Wheeler were in high school. The name All-American Reject was made from either a mix of two suggestions, "The Rejects" and "The All Americans" or the other being that it came from a song "Reject" by Green Day and had the chorus, "a reject, all american". "Swing, Swing" · "The Last Song" · "Time Stands Still"
"Dirty Little Secret" · "Move Along" · "It Ends Tonight"
"Gives You Hell" · "The Wind Blows" · "I Wanna"
"Beekeeper's Daughter" · "Kids in the Street" · "Heartbeat Slowing Down"
This page was last changed on 27 May 2016, at 18:27.